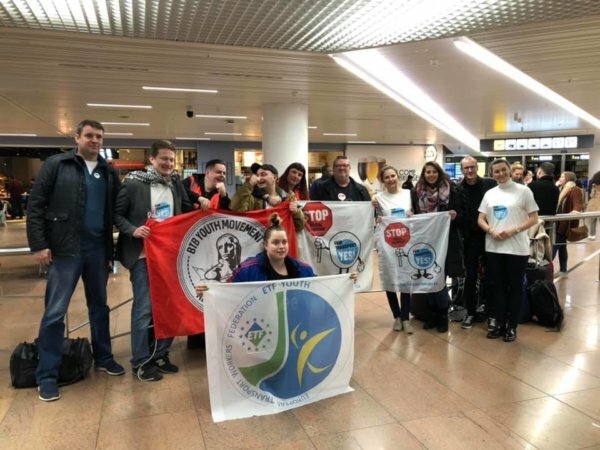 As part of our action week for Fair Transport in Europe, the high point of our campaign against social dumping and exploitation, the ETF Youth Committee is organising a series of Youth Journeys. Young activists will be travelling towards Brussels for the massive demo on 27 March, acting as video reporters on the way. They will be using all kinds of transport to travel across Europe, and speaking to the transport workers they meet on their way about the daily reality of social dumping and exploitation. Then they will share what they have discovered, and their own reflections, in a series of video diaries. Our Eastern group gains some new members, attends a conference in Gdynia, learns about the challenges for dockers and appears on Polish TV. Meanwhile a second group gathers support from Fair Transport from young workers in London, before setting off for the overnight ferry to Rotterdam. Our young activists from Nautilus International arrived in Rotterdam, where they had a chance to chat about common challenges and learned about the Netherlands’ extensive system of canals and inland waterways. Meanwhile our Eastern group arrived in Berlin, where they discussed how to get young workers on board of the unions, as well as how to make Europe more social. And finally a new group left Rome to fly on a Ryanair flight to Paris. There they heard about the struggles that Ryanair workers face day to day. Are we going to fight to improve conditions at Ryanair? Absolutely!